Time to maximize the Minimates questions! It’s an all-new Ask DST with DSTChuck, and this time it’s all about Minimates! Read on! Any plans for more Marvel Now figures, like Deadpool, Thor, Falcon, Cyclops, etc. or Age of Ultron box sets? DSTChuck: Not really sure. With MM, we always try to balance new editorial with classic, so not sure right now. I guess we’ll wait and see the fan reaction to the comics as well as Minimates. Hello again! I’m back with some more questions! Let’s get started, shall we? 5)-Will we see any new licences at comic con or any time this year? 7)-Do you think you’ll make Halo minimates again? I’d really like to see minimates from the new trilogy and with the halo tv series hitting soon i’m sure they sell a lot! After all, MC will show some more new IPs and exclusives at E3. DSTChuck: OK here you go! 1)	Always a chance to see more Spidey! 2)	I love those X-Men almost as much as Spidey, and if you could not tell I have a soft spot for prior to ’95 time. 3)	Not in the plans right now. 4)	No plans right now, but I would think so when the new movie rolls out. 5)	Just got back from SDCC, hope you’re as excited by what we showed as we are. 6)	We’re not a huge video game company, but we do pick our spots here and there and classic or long-standing properties is an area we look. 7)	I don’t think Halo is in the plans for any time soon, but if Microsoft calls we’d certainly be interested. 8)	I suppose that would depend, some no some yes- for example Nintendo for sure. Hello DST and Chuck! I’m loving all of your Marvel symbiote minimates. I have almost every Venom minimate (excluding Mac Gargan and Dark Spider-Man), Anti-Venom, the Venom Through the Ages box set, and several symbiote/black suit Spider-Men. I really missed out on Carnage, though, and hope to pick him up somewhere on the internet eventually. My question is: is a Venom Family box set or wave out of the question? By “Venom Family,” I mean Venom and all of his spawn and their spawn, such as Carnage, Toxin, the Life Foundation symbiotes, Hybrid, etc. If it is, then perhaps can we get Toxin (Pat Mulligan) and Toxin (Eddie Brock) minimates, and either a reissue or new Carnage minimate? Symbiotes are like french fries; they’re bad for your health, but you just can’t have one…or two…or ten. Also, can Angelo Fortunato, the Venom host between Eddie and Mac, get some love? It’d be cool to line up all four hosts of the Venom symbiote. Anyways, thanks for the awesome minimates and keep up the good work! DSTChuck: Venom family would be very cool and very possible in the future, but not planned at this moment. I do think it would be a four-pack, not more. It’s rare we do anything other than one-packs, two-packs and four-packs. Hello there, I was just cruising the internet and saw a pic of Mumm Ra the ever living. Well i saw a one sheet anyways. Is this minimate going to be made for the thundercats line? Maybe a comic con exclusive? Also, is there any word on when the Aliens minimates might be out? Oh yeah… so when are He-man minimates gonna make their debut? If they ever come out would they be in 2 pack for or the 4 pack form? DSTChuck: Mumm-Ra the Ever-Living is in the Series 4 box set from Icon Heroes, but I think the Thudercats line is done with the Series 5 (or Thundercats Ho!) box set. I just wanted to take a minute to write and say how appreciative I am that “the powers that be” have decided to package the new minimate figures with the clear stands. I’ve been collecting this line for several years and have close to 200 figures. In a time where companies have cut costs, it’s a simple inclusion such as this that makes me a devoted customer. Are there any plans to release these stands as a stand-alone item (pun intended)? Thanks for your time and for releasing a great product! DSTChuck: So glad you like them… I tell you my trade show team loves them too! We’ve started bringing bags of stands to conventions, and are looking to offer them online at some point. Will there be a comic based iron monger minimate? DSTChuck: I would love to do one at some point, it would be a great Minimate. They should make Minimates of Assassin’s Creed (all) I’d buy. DSTChuck: Right now we do not have the rights to that game, but some cool designs for sure. Do you plan to make anymore female zombies for the Walking Dead minimates series so far we only have one. DSTChuck: I don’t think we look at that line female/male, we just try and pick the best mix and go along with the story as best we can, but I’m sure we’ll do more female characters. Will we ever see a spider man through the ages minimate box set? DSTChuck: Never say never with Spider-Man. Hey DST, in what wave will u guys make the scarlet spider (2012) (Kaine Parker)? DSTChuck: I have to love all this Spider-Man love coming in. Makes me warm and fuzzy. Any chance we’ll see any Adventure Time Minimates or maybe a Typhoid Mary Minimate? DSTChuck: No plans right now for Adventure Time, Mary is very possible at some point. I was wondering if we would be getting any random movie minimates in the future like ones of past (Rocky, Silence of the Lambs, Suddenly Seeking Susan)? Hellraiser, Big Trouble in Little China, Amadeus, Die Hard, Candyman as examples. How cool would a Lo Pan/Storms 4 pack be? I do like the old toy/cartoon direction with ThunderCats and BattleBeasts. He-Man would have some endless and cool minimates. Obvious licensing issues w/ these suggestions but anything along these lines would be cool. DSTChuck: I would not call it random. The folks at MGM were nice enough to work with us on a library type deal which enabled us to do such an interesting mix of properties. We’re always looking for more cool stuff to do and a studio that is willing to work with us on a similar deal. Hey, Chuck. If some smaller Marvel characters (Dogpool, Hit-Monkey, Rocket Raccoon, etc) were to appear as Minimates in the future do you think you would use the standard minimate body or possibly make them unarticulated pieces similar to Snarf in the Thundercats line? Thanks. DSTChuck: Really not sure, for something like that I refer to the designers. I did not even see something like Snarf coming until they came up with it! So far for your Star Trek legacy line you have had sets just with captains and villains, so I was wondering if we were going to get any supporting characters. Thanks. DSTChuck: If the fan and retail response is strong, we’ll make more Trek Minimates. We’ll keep the same Legacy format for sure, but I’m not sure we’ll keep the hero / nemesis idea going. Hey guys! As a huge fan and collector of Minimates, something has long been on my mind… I love that we’ve gotten so many great accessories (especially weapons) for the characters you’ve produced, but I can’t help but be a little disappointed with the shotguns. Not because they’re bad, just because the figures really can’t be posed with the gun being held in both hands (rifles too). Anyway, I was thinking about a past convention exclusive that was released (Ghostbusters Statue of Liberty), and remembered that she was given a hand turned the to the side, to accurately hold the torch correctly (though I believe the torch was sculpted in). Could we ever see variant hands released like this one, so we can have our Minimates hold their shotguns and rifles better and more naturally? I’d really like to see this happen. Also, are their any plans for a current Marvel NOW! Deadpool? Thanks guys! DSTChuck: Not sure we’ve ever considered that ( I know I didn’t), but maybe it’s something we can look into. Deadpool will be in the Thunderbolts box set. DSTChuck: I can’t say for sure it will be the new standard, but it’s very possible – glad you like it. I see in your announcement for the View Askew minimates that you will be addressing Clerks, Mallrats, Chasing Amy, Clerks 2 and Jay and Silent Bob Strike Back. What about Dogma? It would be great to have Loki, Bartleby and Metatron minimates with wings! How cool would that be? DSTChuck: Some of the View Askew movies are with different studios , so we locked up what we could for now and we’re working on the others as things get clearer with the studios. For now we have tons of cool stuff we can do. DSTChuck: Right now there are no plans for more figures from those lines, sorry. Is there gonna be a Minimates version of phoenix five magik? DSTChuck: I think for now we’re done with the Phoenix 5 but never say never. It seems whenever I submit a question, it’s always begging for a particular Walking Dead or Marvel Minimate. So this time I have two questions; one begging (sort of) and one not. From the Walking Dead series: Any chance we’ll see a non-prison garb Andrea? From early on in the book? I’d love to see that entire first group in Minimate form. We have Carol now, which is great. Although an alternate head/face for when she’s bitten by the pole zombie would’ve been icing on the cake. Not to beat a dead horse, but, I still think you can make Carl and he would look perfectly fine using the Puck type feet. It’ll at least make him a little shorter than the rest of them. Just sayin. DSTChuck: Keep asking (or begging), Kevin – you never know what will happen. For now I think the plan is to look forward with the Walking Dead storyline, so I can’t say it’s impossible we’d go back and do that version of Carol, but its not planned right now. We’re working on Series 5 right now. Carl is not 100% ruled out so… And thanks so much for the kind worlds. We do our best and we’re glad you’re digging what we’re doing. With the new Deadpools Assemble set coming out, the new Deadpool Game, the upcoming Thunderbolts NOW set, and the previously released Deadpool Corps set, Deadpool is obviously an A-lister when it comes to Marvel and Minimates. Are there any plans on creating a Squirrelpool and Dogpool “minimates” similar to Snarf and Wolfrat from the Thundercats set? I think completing the DP Corps this way would be awesome. You could even throw in some more Deadpool accessories, like a chimichanga, and the giant hammers from the game. DSTChuck: We just released the Deadpools Assemble box set at SDCC, so for now there is not another Deadpool set planned, but you’re right, he is quickly rising in popularity. Submit your own question to Ask DST at the top of the homepage! 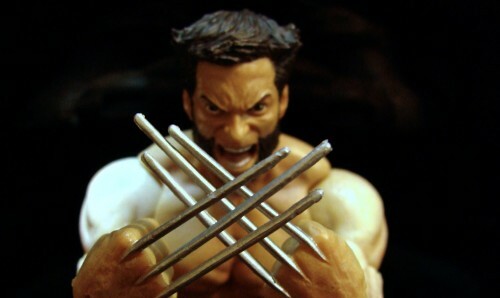 Next Up: New Photos of the Marvel Select The Wolverine Action Figure Revealed! Ask DST #196: The Grab Bag! Ask DST #208 – Boom Go the Minimates!